Vast T2 65 m ² entirely renovated - new, in 1st line waterfront. 1 room. Large south facing terrace with sea & beach views at 20m and beautiful communal pool side entrance. Fully equipped American kitchen. Shower room with walk-in shower. TV, wi-fi-internet. 2nd and last floor of the residence AguaViva very quiet. All shops at 50 / 100m. Direct access to the pool area reserved for the occupants of the residence whose access is closed to the public. We spent 18 nights in this very impressive apartment in the small town of Callao Salvaje. The apartment’s facilities were some of the best we have experienced with Home Away. It was lovely to be able to breakfast and relax on the vast balcony that looked down on the small but beautiful formed beach! 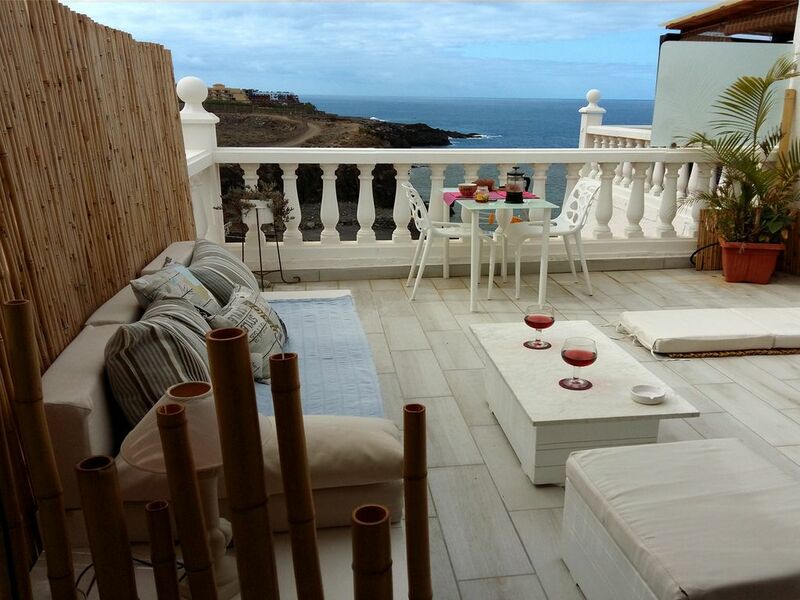 We would happily return to Alexandre’s apartment any time we decide to return to Tenerife. Merci Richard. Nous sommes enchantés de vous avoir accueilli et que vous ayez passé un séjour inoubliable. Nous continuerons à faire le maximum pour nos locataires pour un séjour agréable sans soucis. Au plaisir de vous revoir. Great property. Immaculate. Comfortable. Great people. Thank you Tom for your appreciation. You too are great people, and we had a lot of fun meeting you and making you enjoy a wonderful holiday in Tenerife. We will continue to do the best for our tenants. Full of good things for you. Alexandre. The apartment is very nice and clean, just as on the photos. It has a super balcony with view of the sea. Alexandre organized everything perfectly. We were welcomed on the spot (with some cool drinks in the fridge!) and everything was shown and explained. The beach is nearby as well as some shops which are open until 22h every day. Highly recommended! Wir waren zu zweit eine Woche im App. von Alexandre und wären gerne noch viel länger geblieben. Es ist alles genauso wie beschrieben, die Lage ist top, direkt am Meer, die Ausstattung lässt keine Wünsche offen und Fabienne ist eine super nette, aufmerksame Betreuerin vor Ort. Ich war schon oft in Tenerife aber dieses Mal sicher im schönsten Appartement. Das Apartment ist sehr geschmackvoll und modern eingerichtet. Von der Terasse aus hat man eine hervorragende Sicht auf den Strand, der innerhalb von 5 Gehminuten zu erreichen ist. In näherer Umgebung des Apartments befinden sich außerdem einige Restaurants, Einkaufsmöglichkeiten und eine Bäckerei die allesamt zu Fuß zu erreichen sind. Es war ein sehr schöner Urlaub! Wir würden es jederzeit wieder buchen! Thank you Birgit for your appreciation. I will be happy to welcome you again in the fall.Tell me if I can do something to improve our services. Une caution de 250€ (ou GB£-200) cash est demandée uniquement à l'arrivée à la remise des clefs et rendue au départ après état des lieux. Le séjour durant les fêtes de fin d'année (Noël - NewYear) peut être de moins de 12 jours, mais dans ce cas le loyer reste un forfait équivalent à 12 jours soit = 852€.